Journal photos by Jordan Wald. Mary Ferguson, center, with, from left, Wes, Trott, Casey and Hayes Quattlebaum. Mary Ferguson, center, recently celebrated her 100th birthday at Town Village, with, from left, Wes, Trott, Casey and Hayes Quattlebaum. 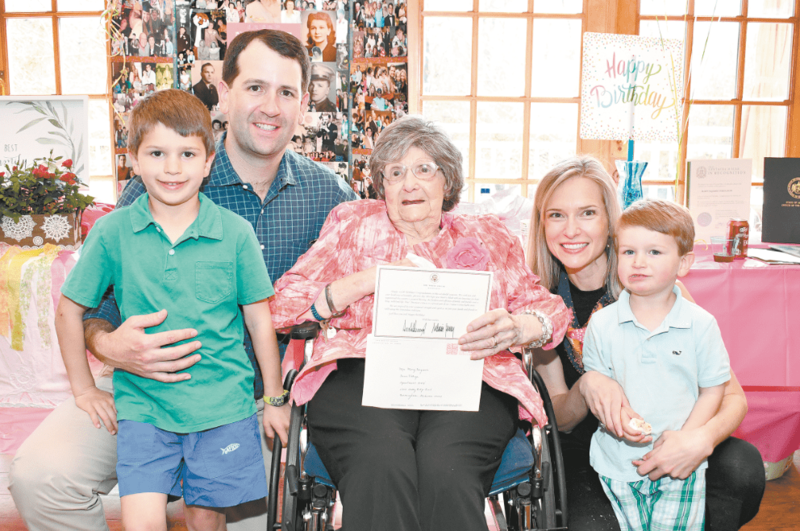 Family and friends of Town Village Vestavia Hills resident Mary Ferguson gathered recently to celebrate her centennial. Mary was born March 22, 1919, to Patrick and Theresa DeJames of Buffalo, New York. She was the fifth of 12 children – five boys and seven girls, according to a statement from the family. Mary was a spirited child, high-achieving and determined to succeed, which her family attributes to her having been a child of the Great Depression and daughter of an Italian immigrant, according to the statement. During her adolescence in the 1930s, Mary pursued a career with the major aircraft manufacturer Bell Aircraft Corp., builder of several fighter aircrafts used in World War II. It was there that she met the love of her life, Ralph Ferguson, in 1941, the family said in the statement. World War II broke out early in their marriage, and Ralph enlisted in the U.S. Army. He was hit multiple times in a heavy artillery battle while serving in France and sustained severe injuries that left him permanently disabled. He returned home to Mary and was presented with a Purple Heart. The couple moved to St. Louis, Missouri, where Ralph enrolled in college at St. Louis University. The couple moved to Birmingham in 1955 and later to Vestavia Hills, where Mary has been an active member of the community for 64 years, especially in the city’s baseball program. Ferguson’s children remained close to home as well. Her first-born child, Mary Catherine Ferguson Gustin of Sylacauga, lost a battle with cancer in 2015, a loss she and her family continue to mourn. Her five surviving children are Patricia Ann Ferguson Echols of Birmingham, Ralph Alton “Sonny” Ferguson of Birmingham, Deborah Ann Ferguson Quattlebaum of Fairhope, Craig Robert Ferguson of Mobile and Randall Anthony Ferguson of Alabaster. According to the family, Mary’s love of God, family, country and Auburn University has always been an important part of who she is and remains evident in her daily life today. She is a longtime member of St. Peter’s Catholic Church, remains active in Vestavia Forest Home and Garden Club and stays busy keeping up with her 15 grandchildren and 27 great-grandchildren.